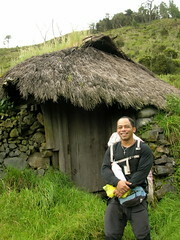 Our Pulag trek started rather earlier than expected. The jeepneys refused to budge just under an hour ride from the protected area office in Benguet. After having lunch at the roadside, we had to hike. But finding little surprises like this charming house along the trail makes the walking worth it.